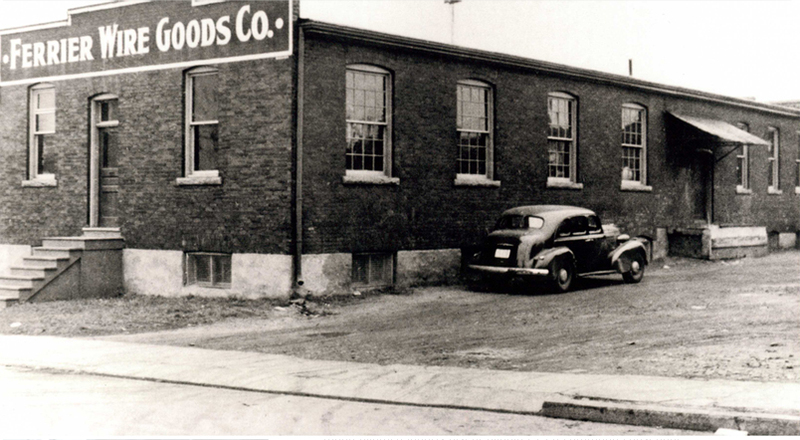 Originally Ferrier Wire was a general wire goods manufacturer founded in 1912 by A. E. Ferrier. In 1917, Ernest Lake bought the company for $1,000.00, and decided to keep its name. The Lake family owned and ran Ferrier Wire until 1978, when the Wiebeck family purchased the business and keeps on running it to this day. In its beginning stages, Ferrier Wire primarily manufactured wire goods such as: baskets, guards, safety stretchers, strainers and so on - all with a workforce of about a dozen men. In the 1960’s Ferrier Wire started weaving and welding wire mesh. This production was complemented by the import, distribution and warehousing of other wire mesh items. These factors lead to the gradual shift from wire products to wire mesh. Later, perforated metals, both with round holes and design patterns and design expanded metal rounded out the product line. Over the years, investment in equipment (flattening rollers and slitter to process the mesh, various welding equipment, specialized fabricating shears, brakes, rollers, and more) have expanded the capabilities of Ferrier Wire. Today Ferrier Wire stocks one of the widest varieties of wire mesh in Canada - with the ability to offer custom weaving, fabrication and worldwide sourcing. Ferrier Wire also offers a growing range of architectural and design products. If you have any questions about our products or capabilities, please contact us.